Saudi Arabia’s Cities of Salt. Abdulrahman Munif was a Saudi writer, famous for his novels parodying the Middle Eastern elite, and examining the changes oil business brought to Arabian deserts. Munif was born a Saudi national and brought up in Amman, Jordan to Saudi parents and an Iraqi grandmother. He started to write in his thirties and quickly became known for his scathing parodies of Middle Eastern elites, especially those of Saudi Arabia, a country which banned many of his books and stripped him of Saudi citizenship. His most famous work is The Cities of Salt quintet, which followed the evolution of the Arabian peninsula as its traditional Bedouin culture is transformed by the oil boom. The novels create a history of a broad region, evoking comparisons to William Faulkner’s Yoknapatawpha County. 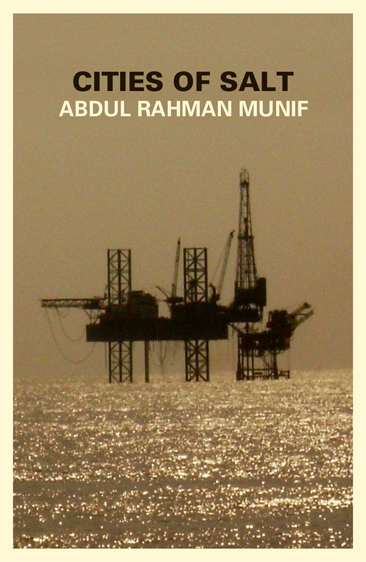 The first novel is Mudun Al Milh (Cities of Salt), one I read and very much liked. The novel creates the great landscape of disruption and change with the coming of the oil age as the Anglo-American technical world begins to move into the rural Arabic world of small oasis towns, caravans and trade. The swift transformation of the tiny, forgotten village in the sands into a modern town for the Americans, and the waves of new arrivals from unknown lands, brought with it problems and situations that were unrecognizable to them. The wadi is transformed. Families are told they have to move. The young men no longer long to go out on the caravans but to work with the machines. What do you say, o company, o God! The oil wealth, instead of modernizing Arabian society, enthroned and perpetuated backward monarchies allied with primitive religious establishments as well as Western governments. And nobody knows how it will change, and will it change at all. “God only knows. He laughed sadly. Four other novels of the trilogy are The Trench, Variations on Night and Day, The uprooted, The desert of Darkness (the last two not translated in English). Munif was one of the biggest critics of Saddam Hussein and his regime, but he was utterly opposed to the American invasion of Iraq and spent the last two years of his life working on non-fiction projects to oppose what he saw as renewed imperialism. Read Munif, he’s great and his work very much applicable today too. → The port city of Al Mukalla, Yemen. ← Israel threatens with tougher actions against Palestinians if they pursue national ambitions.